We all go through periods in our lives that are challenging, stressful, or emotional. No one is immune to a tough day at work, the loss of a loved one, a physical setback, or any other situation that leaves you reaching for the wrong comfort foods to ease your troubles. What if I told you that you can learn to utilize healthier coping mechanisms to get through these situations? What if you knew the secrets to help you take better care of yourself during these inevitable events? What if you can come out of them with little ill-effect on your health and wellness goals? Here are a few sure-fire ways to bust through emotional eating, control cravings, and work through life’s lemons once and for all! Do you find yourself ordering take out for dinner, or mindlessly snacking after a tough day at the office? Are you constantly craving comfort foods like pasta, pizza, ice cream, and chocolate when things are building up and stress is high? Drinking a little too much wine while aimlessly watching Gray’s Anatomy, or some other show on television? These are the things we tend to do when we are trying to numb our feelings. Denying or avoiding your feelings during stressful times with these types of distractions only offers temporary relief. And afterwards, you actually feel worse both physically and emotionally. These behaviors and poor nutritional choices lead to feeling sluggish and moody. When you wake up in the morning after indulging in poor food choices, the emotions you are trying to avoid are still going to be there and you end up feeling even worse. Your body experiences real physical responses to the food you have been eating. It can lead to unregulated blood sugar and hormone levels which can cause you to be physically hungry and moody. In addition, you can experience poor sleep, brain fog (cloudy thinking), edginess, headaches, bloating, weight gain, and low energy. All of these symptoms are the result of making poor nutritional choices to avoid your feelings, leading to increased sugar cravings. This cycle can continue until you change your eating habits to a more balanced approach and take back control of your health and wellness. When I was in college I can remember the first time I encountered stress at mid-terms and found myself obsessing about what I could eat when I got out of class (Famous Amos chocolate chip cookies were my drug of choice). I remember this distinctly because I thought it was so odd that I could not stop thinking about food. This time of my life was clearly the beginning of my emotional eating patterns. I’ve been on this roller coaster ride many times in my life, and I can tell you that there is a better way! Food, alcohol, and caffeine affect your mood. What you eat and drink can seriously impact your mood for the better or for the worse. Being hung over from food or wine is not going to help, and can actually make things worse. Sugar, alcohol, and caffeine do not help you cope – they give you a brief boost (or feeling of pleasure) or temporarily numb the pain and then you crash, and feel crummy. It can become a vicious cycle of eating too much and then craving more. Feeling good makes it easier to cope during stress. You’ll be able to better deal with other people’s emotions and to see more clearly what is a real emotion versus what is a physical reaction that makes you feel crabby and crummy. To feel your best you need to effectively balance your blood sugar and hormones, as well as give your cells the nutrients they need to thrive. When you feel your best, it is easier to cope. You will have much more energy to deal with your troubles when you eat nutritiously, sleep well, hydrate, and exercise. I had one of life’s stressful events this past year that emotionally challenged me in ways I did not know it would. 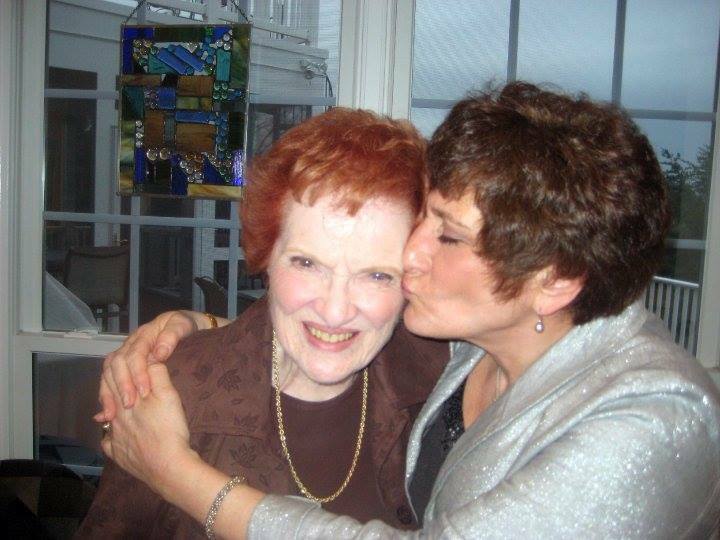 Last Fall, my 90-year-old mother’s health starting failing. My family and I knew we would not have much longer with her, and I was prepared to go spend time with her for an extended period. I was well aware at the time that this could be potentially hazardous to my overall health and wellbeing, so I knew I would have to be very conscious of the choices I would make to preserve my own health, while I was going through this end of life journey with my mother. The death of my mother was the first time I had a serious emotional crisis without putting on 10-20 pounds by stress eating and over indulging in wine. Since my mother lived out of state, I had to spend some time at her house before she passed away and then for a while after. As it turned out, I was there for two months. When I got to my mom’s (knowing I would be there a while), I bought the pantry staples I needed (e.g. the right oils, spices, seeds, etc.) and got a Ninja blender for her house so I could have my smoothies. I joined a Planet Fitness and hired a personal trainer locally so I could work out. I did what I needed to do to put the infrastructure in place to continue my healthy habits, during what would prove to be one of the most stressful times in my life. Throughout this difficult time I advocated for my own health needs, and you can learn how to do this, too. You can find healthy choices almost anywhere. My best advice is to do the best you can wherever you are. Resist the temptation to just do “whatever” because of what you are going through. Pack some healthy snacks and bottled water if you will be out of the house for a few hours or longer. Knowing I would be sitting in the hospital all day I started my day with a healthy, nutrient packed smoothie before I went. Yes, the hospital cafeteria was tough but I pieced together a reasonable meal while avoiding the unhealthy standard cafeteria fare that may have provided comfort, but would have made me feel worse after eating it. I went for the salad bar and lean protein choices for meals and chose fruit, seeds, and nuts for snacks, rather than prepackaged, processed “healthy” snack foods. The idea is to make sure you plan for the unknown and give yourself the option to make better choices, rather than throwing in the towel and giving up on yourself by giving in to your emotions. Here are some ways you can maintain your health while dealing with that basket of lemons life just dumped on you. Eat nutritious foods, lots of veggies and healthy fats, and enough protein. Healthy fats and proteins help keep you full and avoid cravings for sweets and junk food. Avocado, olive oil, coconut, salmon, seeds and nuts are a few examples of healthy fats. Avoid sugar/simple carbs, alcohol, and excessive caffeine at least 80-90% of the time. These will negatively affect your mood, and make you physically crave more. Exercise, even if it’s just a walk around the block (or down the halls of the hospital). The day before my mother’s memorial service I was edgy, moody and unsure of what I was going to say at the service. I decided to go to the gym and bang it out hard on the elliptical. When I left I felt energized and steady, with a clear understanding of what I was going to say the next day. Exercise is a great promoter of feel-good endorphins. And, you will never regret exercising once your workout is complete! Sleep. Try to get about 7-9 hours a night. Shut down your electronics at least 1 hour before bed. Set a relaxed atmosphere by listening to music, or reading for a bit in bed to help promote sleep. Most people don’t drink enough water. Be sure to stay hydrated throughout the day. It really makes a difference! Poor hydration can lead to feelings of hunger and a host of other issues. Remember, adopting healthier habits doesn’t happen overnight. You need to be mindful and think about what you are doing. Have conversations with yourself when faced with choosing between healthful nutrition or tempting comfort foods. Ask yourself how you will feel if you have those tempting foods. Then ask yourself how you will feel if you make a better choice. Will the junk food be worth it? Are you really hungry? Will you regret it? Do you really want it? This is how to be mindful when it comes to making food choices. Planning is another key to the success of beating your stress eating habits. Plan your meals and your exercise. Make a date with yourself and mark your calendar if you need to. Keeping a list of the healthy foods you need to stock up on and sticking to the list when you grocery shop is a great way to avoid temptation later. You only have to say no once at the grocery store! Once it is in the house, it may start calling your name. The best defense is to have the right foods on hand and none of the junk. If you are going to be out for a long period of time, be sure to pack a small cooler bag with your meal or snacks so that you don’t feel tempted to make poor choices. Learn how to view self-care in a different perspective. It’s an investment in yourself. It is not selfish. As the saying goes, you cannot serve from an empty vessel. You cannot help others if you are feeling run down and stressed. And speaking of investment, it might cost some money but you aren’t spending money on junk and you WILL have more energy and be sick less. Be kind to yourself in the event you don’t always make the best choices. It takes some practice and time to adopt these coping mechanisms. Do I ever “slip up?” Yes. Do I dwell on it? No! Does it happen frequently? Not anymore. Treat yourself as you would a good friend, and give yourself the same encouragement you would anyone else. The longer you eat and live well, the more it becomes habit and therefore your new normal. You get to the point where you prefer good, healthy “real food”. Because you KNOW how good you can feel and your taste buds change. Really! Making the choice to stick to your healthy habits and goals is a life-long commitment. It really is possible. If you tell me you don’t have time I will say you aren’t treating it as a priority. Making healthy choices is easier when you are not in the middle of a crisis situation, so by starting now, you will have these habits in place during tough times that are sure to come. Do you need help shifting your coping mechanisms and healthy habits? My one-on-one coaching sessions have helped many of my clients shift their mindset, modify their behaviors, and learn how to bust through emotional eating when they most needed to, and it can help you too! Contact me today to get started!